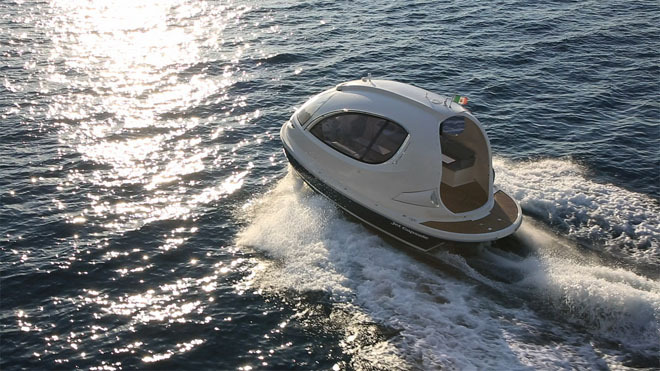 Italians introduce the Jet Capsule – a Pod of Luxury! Fresh off the shelves of Italian design firm Lazzarini is the Jet Capsule, a unique vehicle that could only be described as a… pod. It would not look out of place in a 1950s sci fi movie, however it is remarkably comfortable and powerful, with a cruising speed of 25 knots and an interior as surprisingly spacious as Dr Who’s tardis. 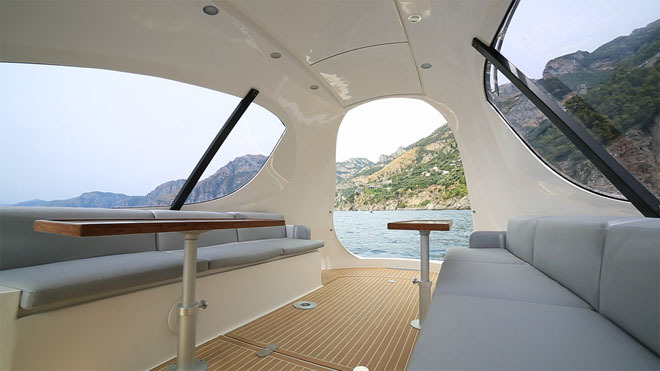 The Jet Capsule has most of the amenities a luxury yacht can offer condensed into shell measuring 25ft by 11ft. With a rooftop platform for sun bathing, seating for eight, a diving platform, teak flooring, toilet, a bedroom conversion and the ability to add a kitchen into the main compartment, this is the perfect boat for a weekend`s adventure in the Mediterranean. According to the designer, the Jet Capsule was created as “a boat small enough to be easily manoeuvred, yet spacious enough to take a handful of friends out for drinks, over to a port for an evening’s entertainment.” Whatever your thoughts on its aesthetic beauty, chartering the Jet Capsule will be guaranteed to turn a few heads. Pricing hasn’t been announced yet, but Boatbookings is sure she is to be considerably more expensive than your weekend fishing boat. And Lazzarini has plans to offer fleet customization services, including an emergency and rescue design, a water taxi, and even an armoured version for the military.